The new edition of the cult classic, Codex Seraphinianus (Rizzoli, $125), was one of the three “coffee-table books” that made our annual holiday gift guide (Art Made From Books, reviewed here, was another). Originally published in 1981, this whimsical encyclopedia-of-sorts was conceived and designed by an Italian artist/architect named Luigi Serafini. Since then, several editions have been released to an avid collector base. The first edition is by far the most coveted and valued upwards of $5,000, but booksellers also offer the 1983 Abbeville Press edition in the $1,000-2,000 range, and still later editions command healthy three-figure prices. 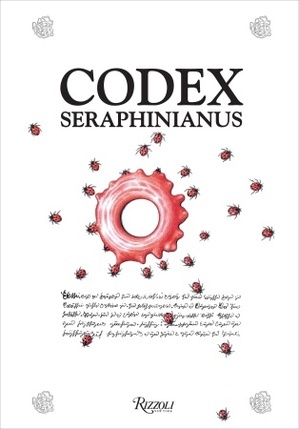 Codex Seraphinianus is an art book in the most direct sense--there are big, beautiful drawings accompanied by indecipherable letterforms--and it is impossible to “read” it in a literal way. Form prevails, and that form is an elegant large quarto bound in cream canvas with gold lettering and laminated decoration, containing thick, textured paper. When paired with the cryptic script, Serafini’s surreal illustrations recall centuries-old manuscripts of natural history--and yet the overall effect is not old-fashioned; it is Salvador Dali and Italo Calvino with a dash of Dr. Who. Rizzoli’s newest edition, Codex Seraphinianus XXXIII, is published to coincide with the book’s thirty-third anniversary. It is available as a deluxe limited edition signed by Serafini for $400 or the trade edition for $125. The text has remained a mystery all these years, and perhaps that’s part of its draw as an art object. And if you think the Decodex pamphlet provided in the book’s back pocket will give you even a sliver of understanding, think again. In it, Serafini tells us that the true author of the Codex was a stray white cat found on the streets of Rome. The new edition of the cult classic, Codex Seraphinianus (Rizzoli, $125), was one of the three "coffee-table books" that made our annual holiday gift guide (Art Made From Books, reviewed here, was another). Originally published in 1981, this whimsical encyclopedia-of-sorts was conceived and designed by an Italian artist/architect named Luigi Serafini. Since then, several editions have been released to an avid collector base. The first edition is by far the most coveted and valued upwards of $5,000, but booksellers also offer the 1983 Abbeville Press edition in the $1,000-2,000 range, and still later editions command healthy three-figure prices. Codex Seraphinianus is an art book in the most direct sense--there are big, beautiful drawings accompanied by indecipherable letterforms--and it is impossible to "read" it in a literal way. Form prevails, and that form is an elegant large quarto bound in cream canvas with gold lettering and laminated decoration, containing thick, textured paper. When paired with the cryptic script, Serafini's surreal illustrations recall centuries-old manuscripts of natural history--and yet the overall effect is not old-fashioned; it is Salvador Dali and Italo Calvino with a dash of Dr. Who. Rizzoli's newest edition, Codex Seraphinianus XXXIII, is published to coincide with the book's thirty-third anniversary. It is available as a deluxe limited edition signed by Serafini for $400 or the trade edition for $125. The text has remained a mystery all these years, and perhaps that's part of its draw as an art object. And if you think the Decodex pamphlet provided in the book's back pocket will give you even a sliver of understanding, think again. In it, Serafini tells us that the true author of the Codex was a stray white cat found on the streets of Rome.